In 2014, Music Historian experienced its most decorated year. The New Music Seminar opened opportunities to listen to industry experts. Through this event, I also spoke to musicians who currently modernize classic rock and Americana, (Kim Logan and the Blackfoot Gypsies), revitalize the sounds of 1970’s funk and soul (Juicebox), and pay homage to some rock genres critics have often thought of as outdated or even obsolete, including grunge (Desert Sharks). The Governors Ball Music Festival presented a chance to apply the market research, strategy and consumer studies I had gathered at Business School in real life, and an interview with The Naked and Famous. Finally, during CMJ, my business colleagues introduced me to musicians who stood up for specific causes. Janna Pelle, for example, raised awareness for pre-Leukemia. Then, YUZIMA addressed the pettiness of homophobia with his artistic flair. Looking back on a fantastic year, I am curious people say in the final weeks of 2014 about The Governors Ball Music Festival, New Music Seminar, and CMJ. I look at what people Tweeted over past three weeks and created a word cloud analysis to understand what was trending in regards to these events. Here is what I learned. 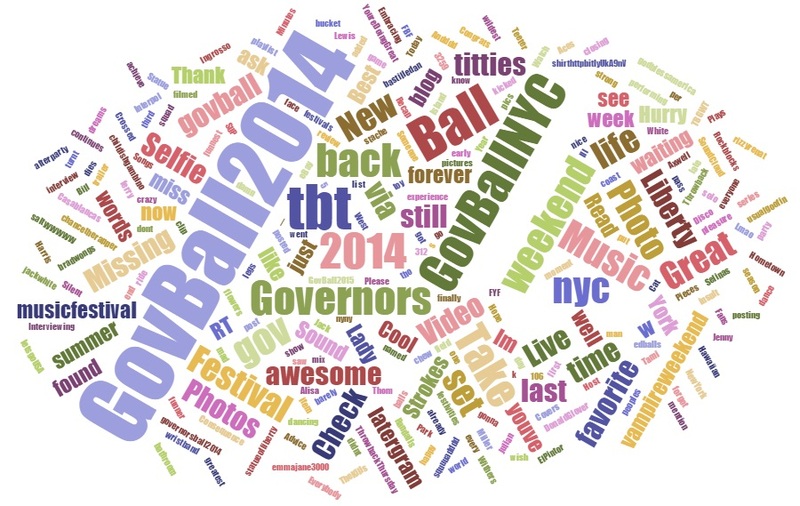 “Tbt” appears in this word cloud as one of the largest after GovBall2014. Those of you Twitter fans know it stands for “Throw Back Thursday.” Naturally, one can assume that many remember the 2014 Governors Ball Music Weekend in the final weeks of December. As for musical acts that appear in the cloud, it appears that the Strokes and Vampire Weekend show up on most these Tweeters’ minds as December comes to a close. Out of all the musical acts that the Governors’ Ball brought New Yorkers; these were the two bands which came out on top. In terms of consumers’ behavior at the festival, aside from the obvious subject, music; the words “festival,” “photos” and “selfies” might indicate that this event was also a time for many celebrating together to make memories. Based on the activity I saw of people interacting with one another, I can say this is definitely the case. 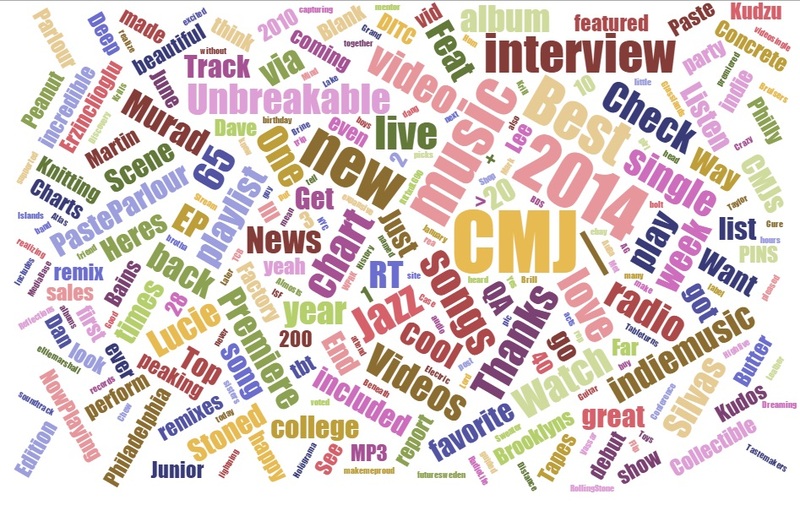 In the case you notice this word cloud is more compact than the last, that is for one reason only – I wanted to make sure I gathered at least 100 Tweets for each cloud. In the case of the New Music Seminar, those Tweets extended all the way to June 11th, the day after the event concluded. Meanwhile, GovBall2014 and CMJ, included 100 Tweets that were posted between early December and now. So what do I see for this word cloud? 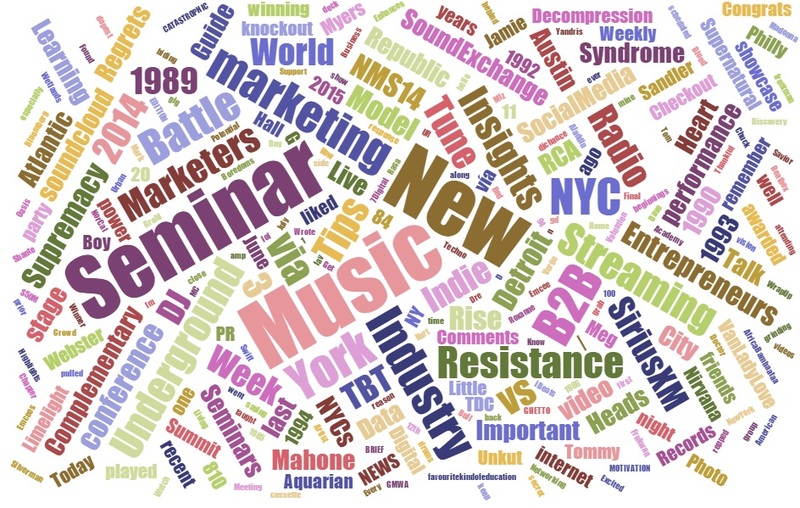 Aside from New Music Seminar, I see “marketing,” “insights”, “streaming,” “industry,” “underground,” “marketers,” “Tips,” “Tune,” and “Battle.” This last word most likely refers to the battle of the top three bands at the 2014 NMS looking to win prize money. These bands included VanLadyLove, Kiah Victoria and June Divided. VanLadyLove seems to be the only band which has appeared in the cloud. This is no surprise since they won the battle of the bands at this year’s NMS. Just like the word cloud for GovBall2014, you will see TBT. So what did Tweeters throw back on Thursdays where the NMS is concerned? Pics and articles of artists from the NMS in the late 80’s and early 90’s who quickly became famous, including Nirvana and Madonna. These Tweets that go to show readers that no one can ever expect who from the NMS will make it to the mainstream in the music industry a few years. Jazz refers to “The Jazz Junes” from Philly, which have been popular in many Tweets. An interview with CJAM 99.1FM (Windsor, Detriot, MI) Music Director, Murad Ezrincioglu by CMJ received plenty of attention. Then, the English-born, New Zealand-raised, Nashville newbie, Lucie Silva premiered her song “Unbreakable Us” at this event too. The smart chart I have made below shows that looking at both quantifiable and qualitative information within the content is important. For whom does this information matter? A marketing consultant or public relations consultant working with a musician, or a music journalist? I would say for both. At least this is what I learned as a marketing student at Baruch College, as I completed a course in web analytics and intelligence. In this class, my final project involved working with Brandwatch, a social media listening tool and using it for the Music Historian. 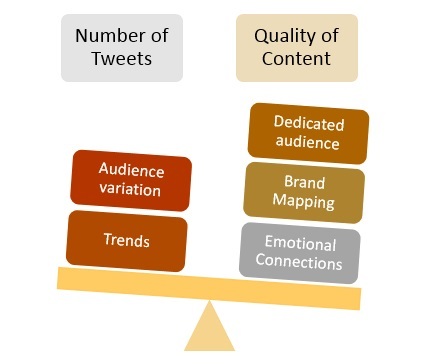 While I did not know it then, I would soon learn that tools like Brandwatch looked very closely at trends on Twitter regarding specific news stories and examined both the quantity and quality of Tweets. When I did some research about the music consumer at the Governors Ball Music Festival back in June, I used this tool to see which Twitter users would be most interested in attending the event. Please read more here. Further, those who expressed interest by Tweeting about bands they looked forward to watching at the festival, made part of a specific demographic I would have never discovered otherwise. Social listening is certainly one way to gather information about music consumers who would show interest in the musical talents at a specific event. Most importantly, social listening might also provide marketers, public relations experts and journalists information on how audiences perceive a musical event without having to reach these consumers personally. While social listening is one way journalists can improve their research in regards to what people say about new bands and music; I also would like to see more actual music journalism. Just like I discussed with Janna Pelle last month, former musicians have their reasons for discontinuing music. Nevertheless, they still have an ear for music that they had developed when they played an instrument and spent more time performing. These types of inquiries should only be asked if they are essential to the context of the conversation. If your research can already answer the question, DON’T ASK! If a publicist provides you with a press release about an artist who announces they are working on a new project, study that release. Doing so will help prevent redundancy and focus on what you really want to know about the artist. Further, the artist you are interviewing is also a business person with plenty to do. I guarantee the artist will feel like you are respectful of their time by asking questions they have not already answered through any press materials, including their social media profiles. Like many, I agree that you don’t need to get too technical with an artist about their songs. You are trying to understand what motivated a musician in their songwriting by listening to their answers to your questions. On this note, don’t ask loaded or uncomfortable questions about a performer’s personal life, finances, or families. If the musician specifies that personal values like religion, social issues or inspire their songs, then you are welcome to ask these questions. Remember to ask in a context that will not diverge from the topic you are most interested in – their music.